Liverpool youngster Yan Dhanda has become the first player of Indian heritage to sign a professional contract with the Anfield club. 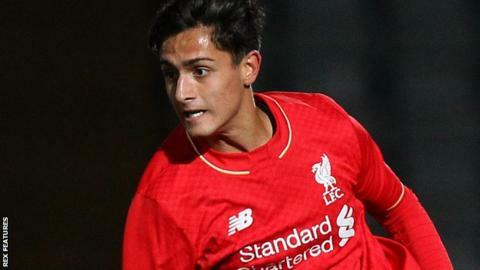 Birmingham-born playmaker Dhanda, 17, joined the Reds' academy in July 2013 from West Brom and has signed a two-and-a-half-year deal. He is the second British Asian with a professional deal in the top flight, with Swansea's Neil Taylor the other. Dhanda has also played for England at under-16 and under-17 level. The attacking midfielder won the up-and-coming player category at the Asian Football Awards in 2013. "We don't take a player because he is Asian and we don't not take a player because he is Asian," Liverpool managing director Ian Ayre told BBC Sport at the awards ceremony at Wembley in 2013. "It's about finding the best talent regardless of where they come from. You are only going to choose someone and put them in your squad if they can genuinely compete for a place in your first team. "Yan has a fantastic opportunity at Liverpool. He is a very talented young man and we hope he will achieve the best he can do."